While we receive countless testimonials from families who attend our Mindful Littles events about the positive impact of our work, it isn’t often that we are able to speak with the beneficiaries of our service projects- the ones who receive the hygiene kits, the food baskets, the meals and so much more. We know that the populations we serve feel the impact of our work when we learn of stories such as a Youth Homes foster care child saying that “it felt like Christmas” to receive one of our hygiene kits. But it’s a rare opportunity to be able to speak to someone directly. Recently we were lucky enough to have this opportunity with a veteran named Travis Groft. Last November on Veteran’s Day and then again this year right before Valentine’s Day, Mindful Littles hosted an event to honor and express gratitude for veterans. We partnered with Veteran’s Path- an organization dedicated to helping veterans cope with PTSD and develop resiliency after their time serving in the armed forces. During both events, we spoke of the sacrifices veterans make and made peace kits for veterans which included things like beaded bracelets, friendship rock, lavender pouch and more. During our two Veterans events Travis and his 10-year old daughter, Gaby, led our Mindful Littles families through a yoga story routine that they put together. Watching Travis and his daughter together lead a yoga and mindfulness practice was truly magical. Their sweet father-daughter bond was abundantly evident. And even more remarkable was to witness a young child with the support of her father cultivate such positive uplifting energy with an entire community. As a veteran himself, Travis also received one of our peace kits from our first Veteran’s event. Travis was so moved by our gift as well as the experience of leading yoga with Gaby that he has joined our Mindful Littles team as a facilitator. He recently spoke to us about what Mindful Littles has meant to him. How did you first learn about Mindful Littles? 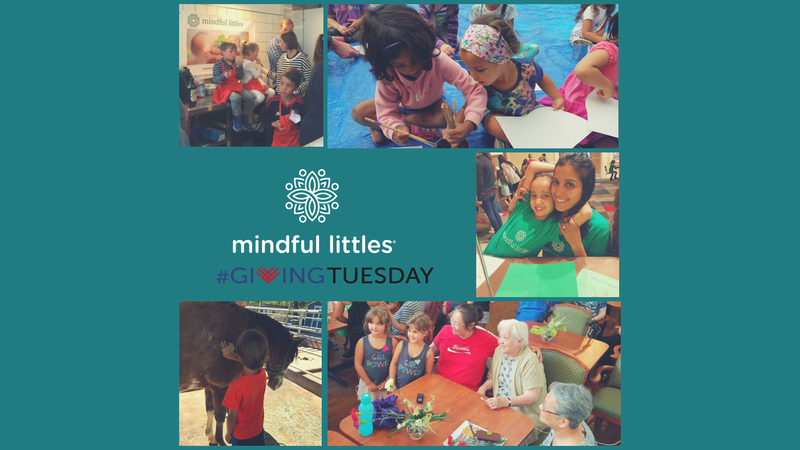 I first learned about Mindful Littles when our Veteran’s Path program director, Laurie Senauke, emailed several Veteran’s Path facilitators to join a Veteran’s Day event that a local nonprofit, Mindful Littles, was hosting. At the time we were simply going to host a table at the Mindful Littles event. I looked at the Mindful Littles website and blog, and being a parent myself to a 10-year old girl, the mission and vision of Mindful Littles really spoke to me. I have been trying to expose my daughter to mindfulness and to have greater awareness of the world around us, and the Mindful Littles work seemed like a thoughtful authentic approach to doing just that. I responded to Laurie saying that I would help host a table, not knowing exactly what to expect. How did you and your daughter decide to facilitate yoga at the event? After I decided to volunteer for the Mindful Littles event, I spoke with the Mindful Littles founder, Tanuka, and our program coordinator, Laurie. During our initial conversation and as we learned more about each other, we wanted to share more of the experiential side of Veteran’s Path to help Mindful Littles families understand how veterans experience mindfulness. It seemed so natural that I should show up to share how healing mindfulness has been to veterans. We thought it would be powerful to include my own little in that experience and that mindful movements, or yoga, could be the best way to deliver something meaningful. What has mindfulness meant to you as a veteran? I really appreciate how mindfulness has helped me progress emotionally. The real progress is when you don’t have to hold onto a mask and you are able to work through vulnerabilities. I now let my emotions flow through, let tears flow down my face. The birth of my daughter also changed my life completely. Being in the armed forces and just as a man in general, I have always expressed a very masculine side of myself. Now I have been able to bring out a different aura and essence in myself, being comfortable expressing my emotions and the more feminine aspects of myself. What was it like to lead yoga with your daughter during the Mindful Littles event? Including my daughter, Gaby, in the co-facilitation process elevated the Mindful Littles experience to whole new heights. I was able to empower my daughter in ways that she and I didn’t think were possible. And my daughter got the opportunity to see me in a way that she hadn’t seen before. To be able to co-create something with her was very emotional and beautiful. When we were in front of a huge room full of Mindful Littles families, Gaby naturally had some moments of stage fright, and that’s when I got to support her as a father. We focused on staying in the present moment and I was blown away by Gaby’s ability to show up and lead in a big way. Gaby has an instinctive maternal energy and watching her do her thing as an observer was beyond powerful. I would love to dedicate time and energy to model how fathers and daughters can co-create and co-lead mindfulness and yoga. It will enable a more synergistic society and show how fathers can rear their sons and daughters. Being a leader in this space is a very high honor to me because that’s how I want to show up in the world to help change it for the better. How did you and Gaby decide on the yoga routine? We didn’t spend insurmountable amount of time on building the actual routine. She was excited to do it with me. We knew we were going to pick a few poses and instruct it together. Gaby just wanted to make the routine a story because kids like stories, and so we created a story with some poses that we wanted to do. As a veteran you also received a Mindful Littles peace kit? What did that mean to you? Being a recipient of a peace kit was also really special. The peace kits included tools and tokens to help us stay centered and connected to our practice. After the first Veteran’s Day event, I wore my beaded bracelet everyday for a few months. It serves as a reminder of the beautiful Mindful Littles experience that Gaby and I shared and a reminder to stay connected to my practice. For my bracelet in particular, the stone I “randomly” received was the Orange Agate, which is all about stepping into the person you want to be. It was so appropriate for me as I commit myself to spreading love and peace to our world. It was as if the Universe was telling me that I’m exactly where I’m supposed to be at the exactly the right time. What was the response from other veterans who received Mindful Littles peace kits? I had the opportunity to present the peace kits to other veterans at Veteran’s Path as a final ritual activity. Initially, when the veterans saw little bags from kids, they assumed it was just kids being kids. I explained to the vets what the Mindful Littles event was all about. I explained that Mindful Littles teaches youth to do service work using mindfulness strategies, the same strategies that we were all learning. All of a sudden you could feel the energy shift in the room. Often for veterans there is a disconnect between mainstream society and service men and women. It can be pretty isolating and off-putting. As soon as the veterans realized that these young kids were choosing to help them and were connected through mindfulness, they were uplifted by this energy. The veterans at Veteran’s Path work hard to work on themselves and they were grateful that this work manifested in being appreciated in this special way. It’s a novel concept, but to touch people in this way is extremely helpful on a person-to-person level. The veterans began putting on their bracelets and all asked me to tell Mindful Littles how appreciative they were of our efforts. You have decided to join the Mindful Littles crew as a facilitator. Why is this important to you? The work that Mindful Littles does is the antithesis of the violence. With the continued threat of mass shootings, with homegrown mental illness, you don’t arm people with weapons. You pay attention; you teach compassion, you educate and help community members. This is how we change. This is how we are going to fight the good fight; not with weapons and strategies of self-defense, but by being proactive with love. I believe Mindful Littles is the solution. It will awaken our youth and help contribute to a more positive future. It is the young people who are going to save us from this. And I want to be part of this solution; I want my family to be a part of this change.